Sitting on my pan looking delicious as I could possibly be. Walnut toffee beauty, I am. Happy Holidays, everyone! Christmas just passed… I’m officially excited for New Year’s Day! Are you? What are your plans for this lovely holiday? Will you spend it with family and friends? Will you spend it alone with your pets? 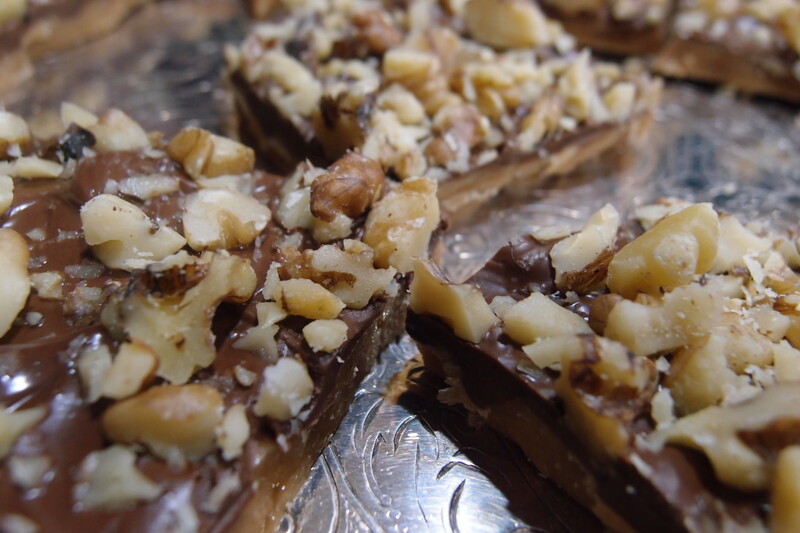 I plan on dancing 2015 away with my tiny family while eating some festive empanadas and munching on this delicious walnut toffee. 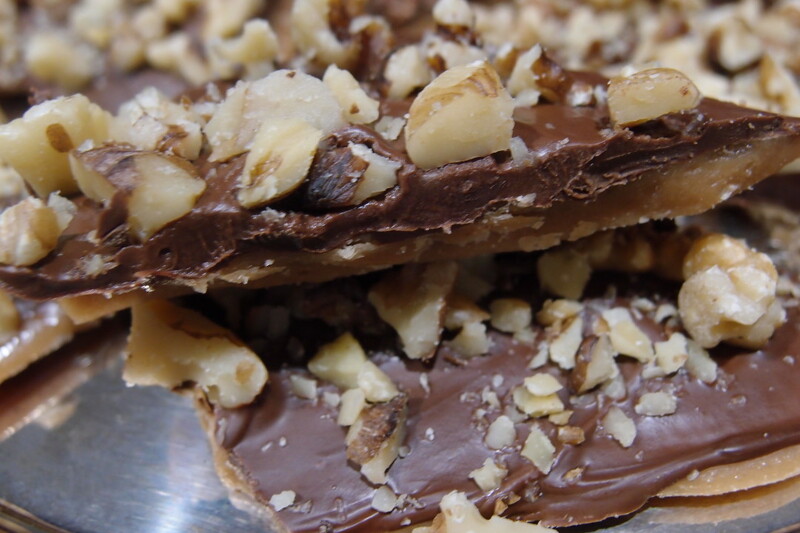 If you have any kind of nut allergies, I suggest you don’t add walnuts to your toffee. You can add some fruits or maybe some different sweets. 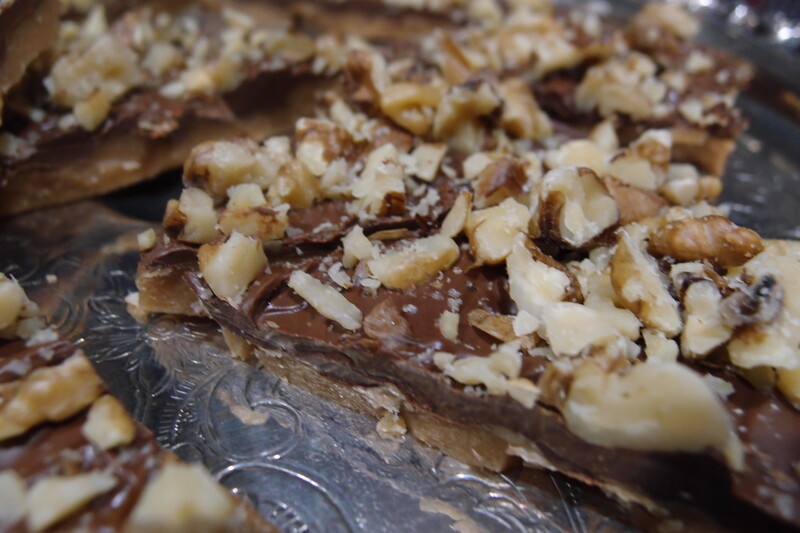 Do what you will with your New Year’s Toffee. Let’s get this easy peasy recipe started! Look at all this New Years toffee deliciousness. Just me and my walnut toffee crew. 1. Get your saucepan and add it to your burner. Make sure your burner is on medium heat then add your butter and wait for it to melt. Once it’s melted, add your cup of sugar and the bit of vanilla. A lot of people like to add everything in at once but I’m not about that life. I like my butter to be melted. The sugar prefers to go into warm melted butter because it feels more secure. The butter acts as a security blanket, if you will. Think of the sugar! Let it know the butter is ready for it and off it goes into a buttery Jacuzzi. You want to keep an eye on your butter/sugar concoction until it turns into a lovely golden brown color. You do not want a dark brown color. You want a golden toffee color. You want to also stir it occasionally to make sure everything is melting evenly. Once it turns said color, you want to remove it from the heat and continue folding it in for a good minute. I noticed that sometimes the butter and sugar won’t immediately solidify. I’m beautiful. This is what toffee should look like. 2. As soon as your minute is up, you want to add/spread the toffee on your prepared pan. You can use a silpat or any other cookie sheet. I used a combination of both because I like stability. Chaos is not good when dealing with hot sugars. Also, don’t dwell too much on the spreading. You want the toffee to be hot in order for your chocolate chips to melt. 3. Is your toffee still hot and spread? Good! now sprinkle on those chocolate chips. Go bananas! Sprinkle all over and cover that toffee. Let the chips sit for a minute or two and then spread. They should be melty and spreading beautifully. If your toffee was too cool then your chips won’t melt. NO PROBLEMO! You can also just melt the chips and spread them melted chocolate on the toffee instead. 4. You’ve gotten this far. You are a toffee warrior and all the toffee people look up to you in respect. They know you are a force to be reckoned with. 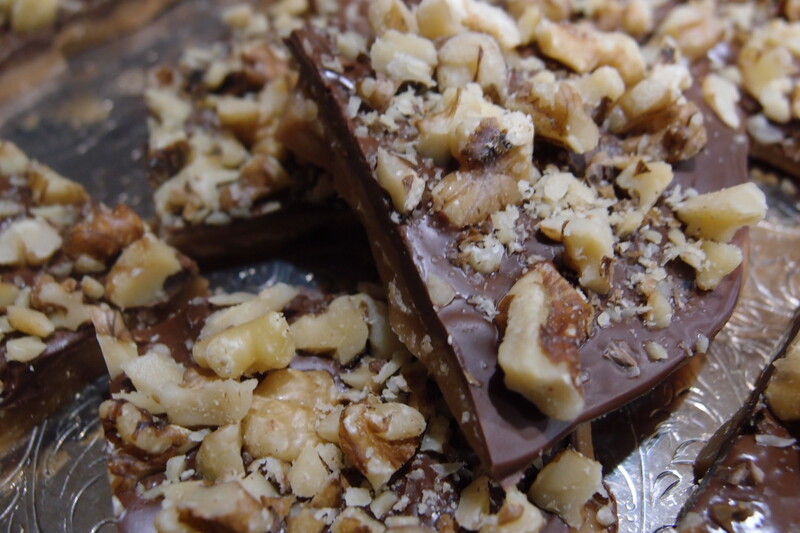 Grab those walnuts and add them to your melted chocolate that is sitting so beautifully on top of your toffee. You want to cover it. You want each bite to have a lots of pieces of delicious walnuts. If you aren’t using walnuts then do this but with whatever you want. 5. Let it sit for a bit to cool and room temperature (I left it out half an hour) then send it packing to the fridge. Give it an hour and the toffee should be ready to nom upon then cut it up. The toffee will break easily enough once chilled. Oh my gosh, this looks so yum!! Almonds would be great with this! Let me know if you do try it. Mama! I love you! <3 Thanks for reading it.